South Korean pop band BTS have broken the world record for most Twitter engagements following their live US TV debut at the weekend. The music sensation beat the record previously held by One Direction star Harry Styles to register 252,231 engagements on Twitter as of November 21, according to Guinness World Records. Styles’s record had been 165,473 engagements on the social networking site. 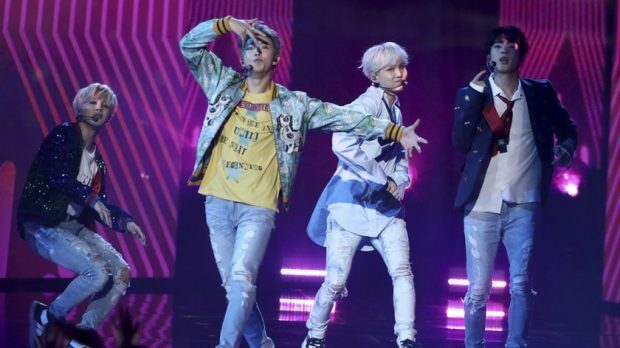 BTS have been growing in international popularity in recent weeks, and their US TV debut at the American Music Awards on Sunday helped to push them over the edge on Twitter by the following day. Guinness World Records looked at BTS’s alternative Twitter accounts, including their management company’s account, and how many engagements – such as retweets, replies, follows and likes – they had garnered up until Tuesday. A YouTube video of BTS’s performance of their track DNA has been viewed more than 4.5 million times in three days. The seven-piece pop group, who have more than 10 million followers, were the first K-pop act to perform at the awards ceremony, and the first of their genre to break into the top 10 in the US album charts. K-pop is an abbreviation of Korean pop, a style of music that is synonymous with a large variety of audio-visual elements and that has gone above and beyond its origins of electronic, hip-hop, pop and rock to become a subculture of its own.